Heat coals or gas grill for direct heat. Fold four 18x12-inch pieces heavy-duty aluminum foil crosswise in half; spray with cooking spray. Cut apples in half; remove cores. Cut each half into 4 wedges. Place 4 apple wedges in centre of each piece of foil. 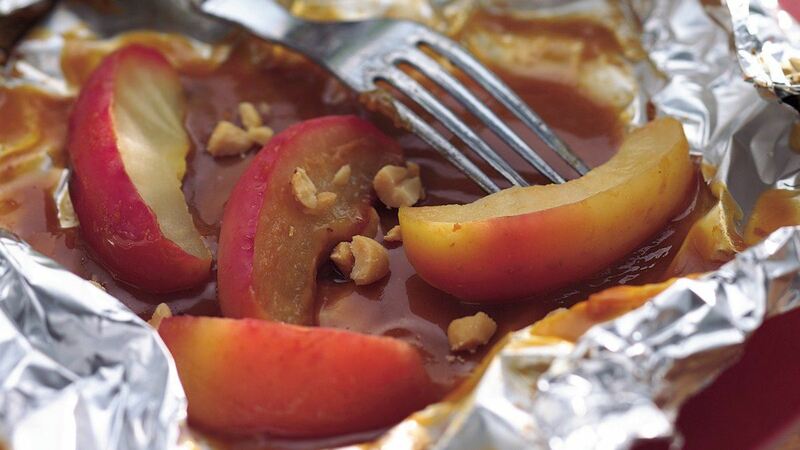 Drizzle 2 tablespoons caramel topping over apple wedges on each piece of foil. Wrap foil securely around apples. Grill foil packets, seam sides up, 5 to 6 inches from medium-low heat 8 to 9 minutes or until apples are crisp-tender. Open packets carefully to avoid steam; caramel will be hot. Serve immediately. Special Touch: Sprinkle a few chopped nuts over the gooey caramel and apples. Success: Use cooking apples for best results with this recipe. Cortland, Golden Delicious and Granny Smith make good choices.